Hello, and welcome to my internet presence! I am an illustrator, painter, and cartooner. You can find my illustrations in The New York Times, The Washington Post, Air France Magazine, The Dove Self-Esteem Project, and The Rumpus to name a few. My other work can be found on my Instagram feed. Most of my illustrations, made with cut paper, are commissioned for articles, but when seen together they become a coherent body of work exploring themes of loss, alienation and anxiety. My favorite materials to use are gouache paint and 140 lb. hot press watercolor paper. As you can guess I also employ scissors and an x-acto knife quite a bit. While my illustrations reside in the realm of painting – its history, process and formal compositional concerns – my cartoons emerge from an interest in narrative, spontaneity and stream-of-consciousness writing. My cartoons address performance anxiety in an absurd world, exploring a sense of humor and pathos. I use pen and ink and colored pencil. One of my cartoons has appeared in The Stranger (the comments are uplifiting) and my illustrations have been selected to appear in American Illustration 32 & 35 and have been featured on It's Nice That. I've also exhibited my work nationally and internationally. I live in southern California with my husband and our 9 year-old daughter. 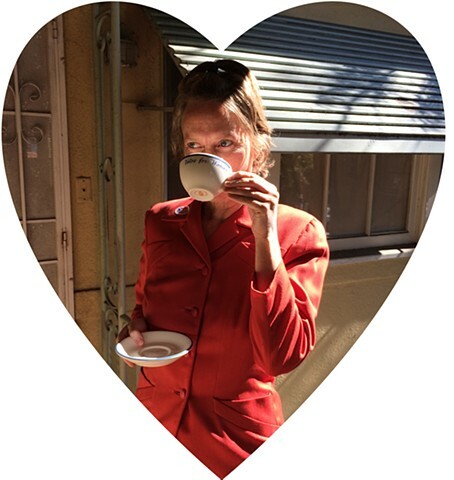 In this feminist photograph of me from Election Day 2016, I am wearing a vintage coral pantsuit and drinking coffee from a "Votes for Women" replica ceramic cup with matching saucer.